Skinput, could help people take better advantage of the tremendous computing power now available in compact devices that can be easily worn or carried. The diminutive size that makes smart phones, MP3 players and other devices so portable, however, also severely limits the size and utility of the keypads, touchscreens and jog wheels typically used to control them. "With Skinput, we can use our own skin - the body's largest organ - as an input device," Harrison said "It's kind of crazy to think we could summon interfaces onto our bodies, but it turns out to make a lot of sense. Our skin is always with us, and makes the ultimate interactive touch surface"
In a trial involving 20 subjects, the system was able to classify the inputs with 88 percent accuracy overall. Accuracy depended in part on proximity of the sensors to the input; forearm taps could be identified with 96 percent accuracy when sensors were attached below the elbow, 88 percent accuracy when the sensors were above the elbow. Finger flicks could be identified with 97 percent accuracy. "There's nothing super sophisticated about the sensor itself," Harrison said, "but it does require some unusual processing. It's sort of like the computer mouse - the device mechanics themselves aren't revolutionary, but are used in a revolutionary way." The sensor is an array of highly tuned vibration sensors - cantilevered piezo films. 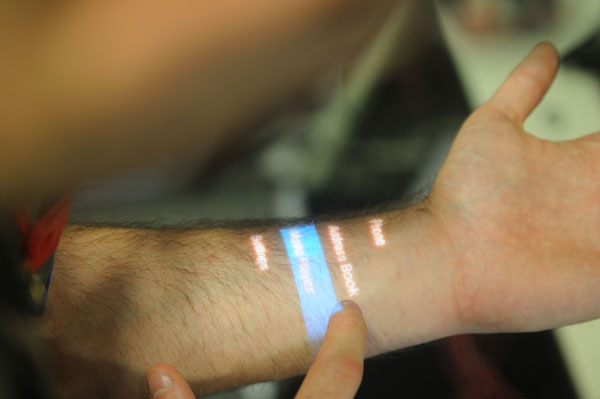 The prototype armband includes both the sensor array and a small projector that can superimpose colored buttons onto the wearer's forearm, which can be used to navigate through menus of commands. Additionally, a keypad can be projected on the palm of the hand. Simple devices, such as MP3 players, might be controlled simply by tapping fingertips, without need of superimposed buttons; in fact, Skinput can take advantage of proprioception - a person's sense of body configuration - for eyes-free interaction.